Thanks in large part to the rampant building sprees of King Ludwig II, the area around Munich features many stunning palaces and castles. From expansive gardens to architecture so iconic it has inspired Disney castles, you’ll find plenty of historic options to explore within a short drive of Munich. Constructed between 1664 and 1674, Nymphenburg Palace was originally a summer residence for Elector Ferdinand Maria and Henriette Adelaide of Savoy. They built the palace to celebrate the birth of their son and heir to the throne, Max Emanuel. Under the reign of Max Emanuel, the palace began to take on its current form. He constructed pavilions to the north and south of the standing palace, later connecting them to the structure with galleries. As the palace evolved, so too did the surrounding land. What began as modest gardens is now the elegant Nymphenburg Park. Visitors can explore both the palace and park. In summer, picturesque gondola rides are available on the central canal. West of Munich, Nymphenburg Palace is included on many private tours including hop-on hop-off bus tours and day trips out of the city. Hours: April – October 15: 9 a.m. to 6 p.m.; October 16 – March: 10 a.m. to 4 p.m. If the lines of Neuschwanstein Castle look familiar, it’s for good reason. Not only is this the most photographed castle in the world, it was also the inspiration for Sleeping Beauty Castle in Disneyland. Built as a private refuge for Ludwig II of Bavaria, this charming retreat near the Alps was ideal for a quiet escape. One of the most popular castles in all Europe, Neuschwanstein sees approximately 1.4 million visitors a year. Palace tours feature more than a dozen rooms including the Throne Hall, bedroom, study, dining room, and oratory. The unfinished second floor houses a cafeteria, shop, and multimedia room. Neuschwanstein is a popular Munich destination often included on day tours along with nearby Linderhof or Hohenschwangau. Hours: March 28 – October 15: 9 a.m. to 6 p.m.; October 16 – March 27: 10 a.m. to 4 p.m. Discover outdoor fun in Munich River Surfing? Though King Ludwig II laid the foundation for Neuschwanstein Castle, Linderhof Palace is the only large palace that he saw completed. Originally a forester’s house, Ludwig II ordered extensive renovations and additions, transforming it into an opulent palace. This extravagant construction features an illuminated grotto, tapestry chambers, hall of mirrors, and elaborate rococo era state rooms. The garden and park outside the palace are as magnificent as the residence itself with the Venus Grotto, Moorish Kiosk, and Gurnemanz Hermitage. Guided tours of the interior are available. 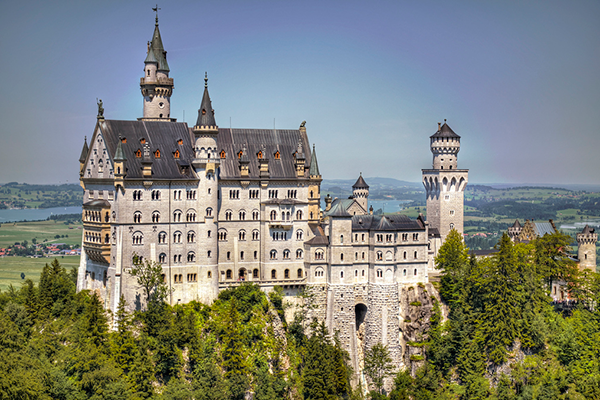 Day trips from Munich commonly include both Neuschwanstein Castle and Linderhof Palace. Hours: March 28 – October 15: 9 a.m. to 6 p.m.; October 16 to March 27: 10 a.m. to 4 p.m. 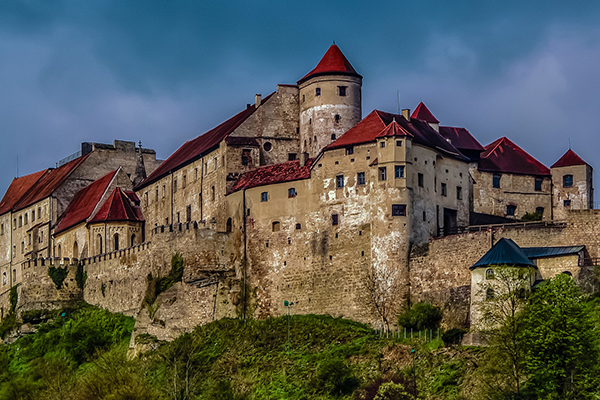 The Burghausen Castle was built with safety and protection in mind. It features ditches, drawbridges, fortified towers, and walls as thick as five meters. With a length of almost 1,000 meters, this is one of the longest castle complexes on the globe. Between 1255 and 1503, the castle housed Bavarian dukes, duchesses, and their courts. Today, the Knights’ Hall serves as a visitors’ center, the Palas houses the Castle Museum, and the second and third floor bower is home to the Burghausen Municipal Museum. From the third floor, you can ascend 62 steps to the viewing platform on the roof. 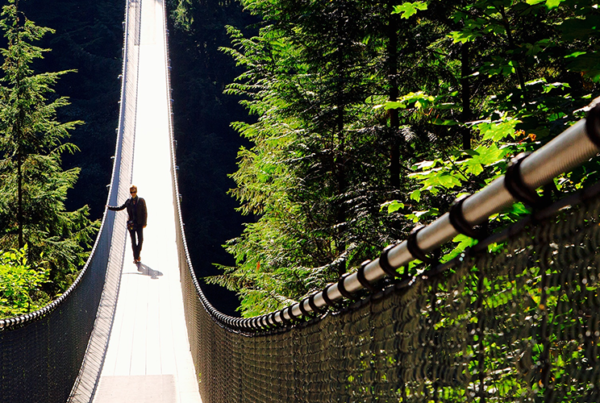 This vantage point offers a breathtaking panorama of the surrounding countryside. About 90 minutes east of Munich, the Burghausen Castle makes for a pleasant day trip. There are no guided tours on site, but visitors are welcome to stroll the museums and courts. Hours: April – September: 9 a.m. to 6 p.m.; October – March: 10 a.m. to 4 p.m. The Munich Residenz transformed over the centuries from an unassuming 14th-century castle into a grand palace. The building that once served as a government seat and royal residence now houses extensive art collections covering the Renaissance, early Baroque period, Rococo era, and neoclassical era. This is one of the few castles located conveniently within the city, so you can book a hotel nearby and make your own way over without dealing with extensive transportation arrangements. The Residenz does not offer guided tours, but free audio guides are available for the museum and treasury. Located in Munich, this castle is one of the easiest options for travelers staying in the city. It does not have its own parking, but is near the Marienplatz S-Bahn and U-Bahn stations, Odeonsplatz U-Bahn station and bus stop, and Nationaltheater tram stop. Hours: March 28 – October 18: 9 a.m. to 6 p.m.; October 19 – March: 10 a.m. to 5 p.m.
King Maximilian II of Bavaria had Hohenschwangau Castle built in neo-gothic style from the remains of the Schwangau fortress. Maximilian and his wife Marie of Prussia spent summers here with their sons Ludwig and Otto. The princes who spent much of their younger years here would grow up to become King Ludwig II and King Otto I of Bavaria. Ludwig II began ordering the construction of nearby Neuschwanstein while living in this castle. After Ludwig’s death, Queen Marie spent the remainder of her life here. Just over an hour and a half from Munich, this castle is a popular choice for a day trip, often combined with the nearby Neuschwanstein Castle. Guided tours are available. Hours: March 28 – October 15: 8:00 a.m. to 5:30 p.m.; October 16 to March 18: 9:00 a.m. to 3:30 p.m. Schedule at least one day trip to take in your favorite picks, and include several days of castle explorations if you want to truly experience all that the Munich area has to offer in the way of breathtaking architecture and storied history. These castles offer an intriguing peek into the past.